Ceiling Fan Medallion – Add warmth and character to your rooms! 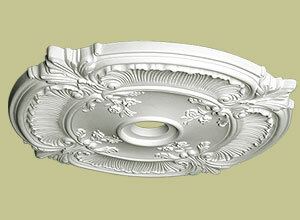 Accentuate your room with a ceiling fan medallion! Whether it’s a round or oval medallion, they are used to hang ceiling fans in areas like dining room, living room or kitchen. 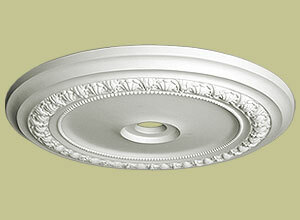 During its inception, ceiling medallions served mostly a practical function. Once lighting fixtures and ceiling fans became the standard, ceiling medallions began serving primarily as a decorative treatment to draw the eye to the lighting fixture, virtually expanding the visual heights of the room, thus, making the room more elegant and lively. 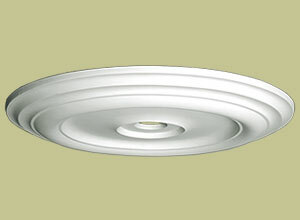 Ceiling fan medallions are available in various decorative styles and in many shapes and sizes. You can use a small sized medallion to add a touch of class to an intimate space, or a large medallion to make a grand statement in rooms like ballrooms or catering halls. 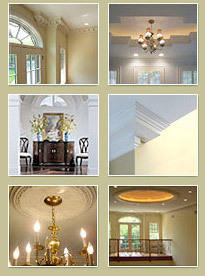 Please visit our installation guide page for complete instructions on how to install our ceiling medallions. Browse our ceiling medallions section to select from our wide range of ceiling fan medallions to enhance the décor of your home.